dfh EZdrummer is a multi-microphone drum sampler designed for musicians and producers in need of a compact, affordable, easy to handle plug-in without compromising sound quality or control. The visualized drums in the interface combines auditioning of sounds and drumkit construction. The extensive drag and drop midi-library (featuring 8000+ midifiles) enables users to create a great drumtrack in just a few clicks. For more advanced handling, users can control microphone bleeding and levels between drums using the internal mixer. The mixer also allows stereo and multitrack routing into the host through one single plug-in, and thanks to the second generation Toontrack Percussive Compression (TPC), system requirements are kept to a minimum. The drums for dfh EZdrummer were recorded, produced and played with the best in the business. From our pro SUPERIOR line we’ve adopted the humanizing features that are instrumental in making our drum samplers the pinnacle in digital drum production. 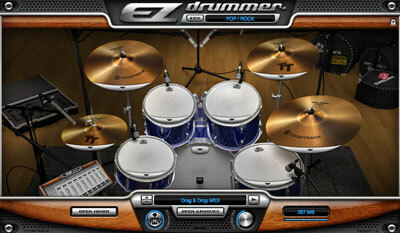 With dfh EZdrummer, Toontrack have stepped into the next generation of acoustic drum-samplers. You’re welcome to follow! • Instant access to more than 8000 drum patterns with prelistening, quick browsing and drag’n’drop functionality. • Same extensive layer depth on all drums and cymbals as in EZdrummers big brother - dfh SUPERIOR. • Velocity sweep allows instant changes to Midi data, extending groove context relevance. • Possibilities for the user to add their own midi files to the library. Алексей Дата добавления: 01 Март 2011 г.
Библиотека очень понравилась. Подойдет и для попсы, и для живой музыки. В миксе сидит отлично. Илья Родин Дата добавления: 09 Январь 2007 г.
Ударные охренительные и простые в использовании. Есть один ньюанс - тарелки подзвучены микрофоном, как бы стоящим в стороне. И чтобы поднять их громкость надо поднимать слайдер этого микрофона - весь звук при этом (всей установки) идёт больше через этот микрофон и становится высоким (плотности на низах не хватает). Но вобщем хорошо звучит. Вы можете получить более детальную информацию о диске "DFH EZdrummer" на сайте производителя. На нашем сайте вы можете скачать или купить почтой DFH EZdrummer. Этот товар поступил в продажу в наш магазин 14 Июнь 2006 г.